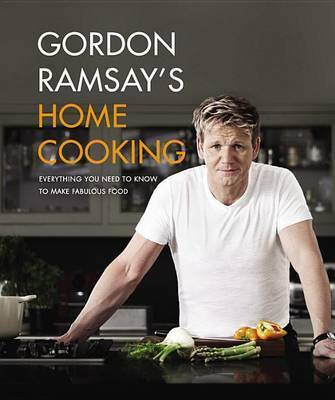 22.22% of people buy Gordon Ramsay's Home Cooking and Gordon Ramsay's Ultimate Home Cooking ~ Hardback ~ Gordon Ramsay. Based on a new cooking show, this book will give experienced as well as novice cooks the desire, confidence and inspiration to get cooking. Ramsay will offer simple, accessible recipes with a "wow" factor. Gordon has travelled the world from India and the Far East to LA and Europe, and the recipes in this book will draw all these culinary influences together to show us simple, vibrant and delicious recipes that reflect the way we eat today. For example: Miso braised salmon fillet with Asian vegetables, Pork and Bacon slider with home made bbq sauce, Curried Sweetcorn Soup, Wild Mushroom Risotto Arrancini, and Baked Lemon Cheesecake with Raspberries. Each chapter will concentrate on a different area of cooking--from the classics to the secret of cooking with Chili and spice, through roasting, baking, and helpful sections on cooking good food for less and cooking for a crowd. Woven into the book will be useful tricks and tips--from ways to save time and money, to cleaning and prepping ingredients, to pan frying like a pro. Stuffed full of delicious recipes, invaluable tips and lashings of Gordon's trademark cheeky wit, Gordon Ramsay's Home Cooking is the ultimate cooking lesson from the ultimate chef. Gordon Ramsay is a world-renowned chef who was awarded 3 Michelin stars for his Restaurant Gordon Ramsay in London. As one of only four chefs in the UK to maintain three stars, Gordon was awarded an OBE in 2006 for services to the industry. Now internationally recognized, Gordon has opened a string of successful restaurants across the globe, from Italy to LA. He also has two top rated shows: Ramsay's Kitchen Nightmares and Hell's Kitchen. His latest show, Masterchef US, is now in its second season, and he is slated to star in a new series, Hotel Hell, slated to air in June 2012. Gordon has also published a number of books, many of which have become best sellers like Gordon Ramsay Makes It Easy to his autobiography, Roasting in Hell's Kitchen.